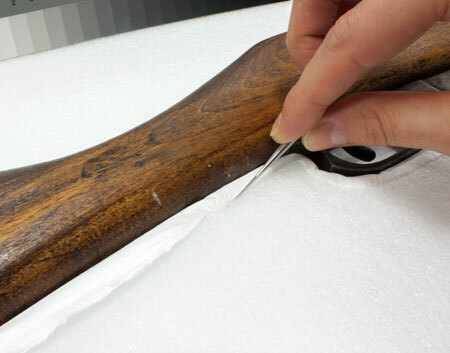 In late 2013, curators from the Tamiment Library and Wagner Labor Archives selected a Spanish Civil War-era rifle for rehousing treatment in the Barbara Goldsmith Book and Paper Conservation Lab. 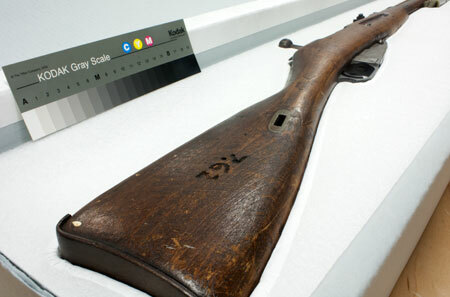 The rifle, which belongs to the Abraham Lincoln Brigade Archives (ALBA) Artifacts collection, had been stored in a long cardboard box and was certainly in need of a safer and more user-friendly housing. 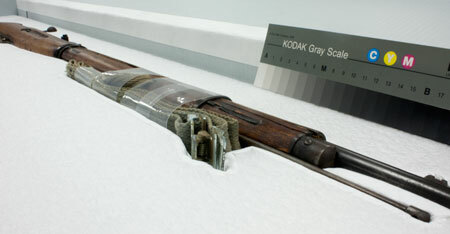 The 4-foot-long rifle came to NYU in 2000 as part of a transfer of ALBA materials from Brandeis University; it had originally been donated to Brandeis in September 1991 by Bill Bailey, a veteran of the Abraham Lincoln Brigade. 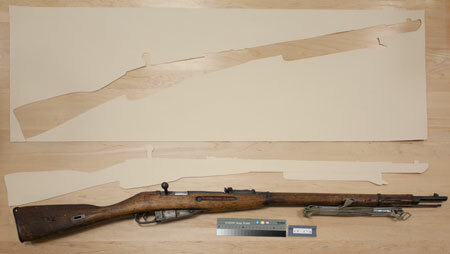 Bailey described the rifle as a “Russian-made rifle used in the Spanish Civil War.” It is known that Russia provided many weapons to fighters in the Spanish Civil War, but it is unclear whether this rifle was Bailey’s personal weapon. 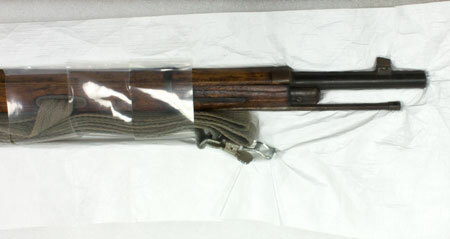 Since this rifle is the first firearm that we have had in the lab, I did some research on the handling and storage of historic firearms. (This document from the National Parks Service was helpful.) Even though a handwritten note on the cardboard box indicated that the rifle was missing its firing pin and therefore non-functional, it was still important to double-check that the rifle was not loaded before going ahead with the treatment. I also learned that it is best to store historic firearms in contact with inert, non-abrasive materials. I decided to build a new box for the rifle out of archival corrugated B-flute board, and to fit the box with a foam insert with a depression cut to the exact shape of the rifle to prevent it from shifting. I began by gathering up the rifle’s broken woven carrying strap and fixing it in place with straps of clear polyethylene to make handling easier. 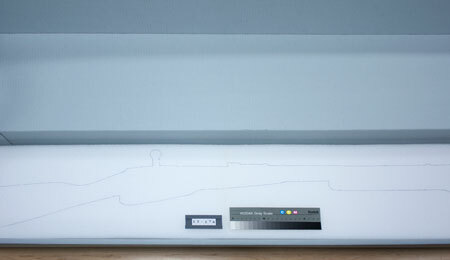 I then took the rifle’s measurements and traced its outline as closely as possible on a piece of thin board; this outline became a stand-in for the rifle when designing the box that would contain it, and a template for the custom-fitted box insert in which the rifle would eventually rest. The next step was to build the box and the insert. The box required an entire 40” x 60” sheet of B-flute board and its design is modified from the simple clamshell phase boxes we make for books. I trimmed 2”-thick planks of Ethafoam (polyethylene foam) to fit the interior of the box, then traced the rifle template onto the foam. Using a heated tool especially designed for cutting foam, I began carving out the shape of the rifle from the foam. I worked in stages, starting with the more finely detailed areas and then moving toward the larger, simpler shapes. Along the way I placed the rifle into the shaped cavity a few times to check the fit and make adjustments as needed. The whole process of excavating the rifle shape was relatively quick – not more than 2 hours or so – and a great deal of fun. When the fit was finally right, it was time to line the cavity. Although Ethafoam is inert, the heat-carved areas were somewhat rough and I wanted a smoother surface and a neater appearance. 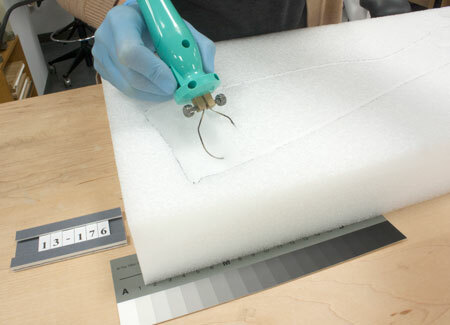 Tyvek, the spun-polyethylene fabric used in home construction and mailing envelopes, is often used by conservators in the construction of specialized housings for objects, and is available in various textures and thicknesses. Soft Tyvek is inert, thin, strong, and flexible enough to conform to the shape of the sculpted foam insert. 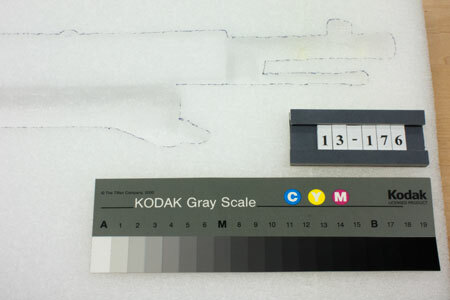 Using a scalpel, I cut a channel outlining the rifle shape approximately ¼” from the edge of the cavity. I laid a piece of soft Tyvek over the foam insert and set the rifle into the cavity, then trimmed the excess Tyvek, leaving a border of approximately 1” all around. With the rifle in place to hold the Tyvek in position, I used a fine spatula to tuck the Tyvek into the channel, giving a clean finished look to the cavity. The completed housing cradles the rifle snugly in its foam bed, and a pair of foam bumpers set into the lid of the box add an extra measure of protection against shifting. The new housing provides a much more stable storage environment for the rifle, and enables it to be moved and viewed safely and easily. Angela Andres is Special Collections Conservator in the Barbara Goldsmith Book and Paper Conservation Laboratory at NYU Libraries.